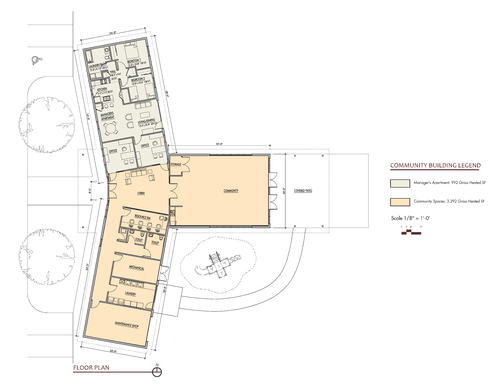 The design for the Sagebrush Apartments, located in Hobbs, NM links this modern community to the area's agricultural heritage and to the larger landscape. Rather than separating the property from its surrounding, the site opens up to an adjacent planned park. Pedestrian paths in the community will be connected to the park’s trail network providing convenient access for residents to recreation opportunities. The park is metaphorically extended into the center of the Sagebrush Apartments in the form of a community landscape featuring a pecan orchard, community garden and lawn with shade trees. The perimeter of the site is planted with native trees and shrubs typical of the natural landscape beyond. Parking is placed on the perimeter with elongated courts, landscaped with gravel and hardy plants, providing access to the 4&6 unit buildings. Roof water is collected for landscape irrigation and site run-off water is directed to the Pecan orchard, simulating flood irrigation typical of orchards in southeast New Mexico. The architectural language of the buildings is a combination of the adjacent ranch homes and nearby agricultural structures. The site is developed with appropriately scaled 2 story buildings with exterior veneer brick with cement board lap siding, to blend with the adjacent neighborhood. The buildings are laid out for optimal passive solar orientation and are sheltered by large overhanging roofs supported by steel pipe trusses & struts, evocative of farm shade structures. The roofs provide ample shade in the summer and swing months while allow solar gain in the winter. Windows are strategically placed to facilitate natural ventilation. The buildings borrow another detail from ranch structures: water storage tanks. Roof water will be stored in above grade corrugated metal cisterns for use in landscape irrigation.